We are the leading supplier of aluminum die casting and zinc alloy die casting in China. Meanwhile, the auto parts is one of main products we offer. These automobile part varying from 10 gram to 200 gram are mostly used as the auto air conditioner parts and parts of radiator devices. All our auto parts are finished on the 138-ton and 160-ton die casting machines through the surface treatments of acid washing and vibratory mulling. We have got the certificate of ISO9001:2000 quality management system, and develop , produce, & sale the sound aluminum die castings, magnesium die casting and zinc alloy die castings with our experience and advanced technologies according to the ISO9001: 2000 quality management system. GC auto parts possess smooth surfaces, high precision and exact dimensions. We can produce all aluminum die castings and zinc alloy die castings including auto parts according to customers’ design drawings, samples and technology requirements. All these auto parts are equipped with complete inspecting methods and quality guaranty to make sure the flawless products. All aluminum die castings and zinc alloy die castings are found in good market conditions globally. Industrial Radiator Accessories varying from 1.5kg to 6kg are mainly applied on the industrial facilities e.g. all kinds of transducers. Our company owns all types of production facilities and supporting equipment such as aluminum die castings and zinc alloy die castings. Our industrial radiator accessories are produced on the 630-ton and 280-ton die casting machines. Industrial radiator accessories are treated by abrasive blasting and cleaning process as well as some complex mechanical processes. So these industrial radiator accessories we offered are characterized by the finish machining and sound quality. With at least 30 years’ manufacturing experience of aluminum die casting and zinc alloy die casting and due to the seized technologies and application of new technologies, GC Non- ferrous Metals Foundry has been the leader in die casting industry. We are sure we can provide our clients with the desired aluminum die castings and zinc alloy die castings. Medical Fitness Machinery Components are mainly applied on the wheel chairs for handicapped and massage chairs. The series medical fitness machinery components include footrests, armrests, handles, and rackets, etc. Most of these medical fitness machinery components are exported to the United States and have won the good market for the sound performance and reliable quality. Footrests are finished on the 630 tonnage die casting machine and are featured by the smooth surface and certain weight capacity. This series of medical fitness machinery components are treated by the plastic coating so as to form original patterns and improve the properties of long durability, water resistance, and strength, etc. Some of footrests can be mounted with rubber mat according to customers’ requirements. Armrests and handles are manufactured on 280 tonnage die casting machine. This series medical fitness machinery components are sound aluminum die castings and zinc alloy die castings. These armrests and handles have smooth surface and reliable performance for the treatment of shot blasting and lacquer coating. Rackets used as the parts on medical machinery are produced on 160-ton die casting machine. They are featured by sooth surface and good reliability. All our aluminum die castings and zinc alloy die castings including these medical fitness machinery components are consisted with the ISO9001 standard. According to the provided design drawings, we can manufacture various motor shell parts/fittings from the weight of 2.5 kg to 4 kg. We have the advanced production facilities of aluminum die castings and zinc alloy die castings, which include 6 automatic die casting machines. All our motor shells are finished on the 630-tonnage die casting machines. The die casting facilities are also equipped with CNC machines, processing centre, milling machines, drilling machines and abrasive blasting machine, vibratory mullers, etc. Surfaces of motor shells and motor fittings are treated by the abrasive blasting, shot blasting and processed on the milling machine, drilling machine. 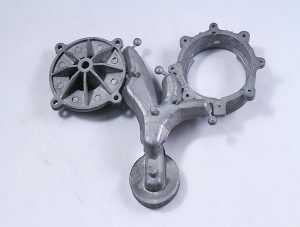 All our die casting products such as aluminum die castings and zinc ally die castings are produced by progressive technologies according to program files. We take every manufacturing stage and details into account, which make the sound quality motor shell and fillings/parts. 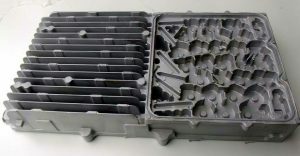 Many of our motor shell and fillings/parts are exported to Europe and have set good markets for a long times because of their firm and long service life, pretty look and free-air vent. 1) Motor box: manufactured on the 280-ton die casting machine and some processes are finished in the processing center. It is featured by exact dimension. 2) Motor fittings/parts: manufactured on the 160-ton die casting machine and some processes are finished in the processing center. It is featured by exact dimension and free-air vent. 3) Various Die-cast flange fittings: manufactured on the 160-ton die casting machine and finished on CNC machine. It is featured by exact dimension and free-air vent. 4) Flow meter: manufactured on the 630-ton die casting machine. Complex structure, anti-high temperature and leakage resistance. 5) Grease gun brackets: manufactured on the 630-tondie casting machine. Complex structure, large projection area, strong and durable. 6) Belt pulley: manufactured on the 280-ton die casting machine. The trough of turntable is treated precisely on machine tools which need high requirements of dimension precision. 7) Hydraulic pressure filter: manufactured on the 630 and 280-ton die casting machine. With complex structure, exact dimension, certain requirement of pressure resistance. These die casting products mentioned above are parts of our die casts. We are sure to offer all kinds of aluminum die castings and zinc alloy die castings and after-sale services for our customers.